Amakusa Kaede is a high school boy who has a troublesome supernatural ability called "Zettai Sentakushi (Absolute compulsory either-or choice)." He has to choose and follow one of two orders which pop up in his mind all of a sudden. Due to the perverted orders he has to follow, he has been infamously known for his crazy behavior among the neighbors. One day, another either-or choice pops up. "1. A bishoujo is falling on you. 2. You are falling in drag." When he chooses option 1, a blonde girl named Chocolat falls on him. 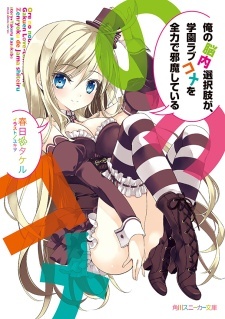 Does Noucome Light novel and Manga have the Same Story?